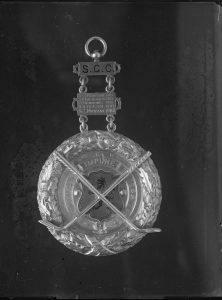 It is always nice to be acknowledged, when you reach the pinnacle of any particular activity, and why should golf be any different This medal might even have been won by players using clubs made by John Duncan. Birdie, Eagle, Albatross, Bogey, Stymie and “Out” & “In” are all golfing terms which only those interested in the game will fully understand I just hope that some of them don’t mean that poor birds flying overhead meet their end via a wee white ball. Maybe it explains why you never see an albatross flying over Stirling Castle! Just one final point Has anyone ever actually seen the ball when Television Cameras are filming the great Golfing Competitions All I have ever seen is the sky and clouds “Spot the Ball” used to be a popular competition perhaps where golf is concerned it is a skill only a few possess!